I am unable to use both Affinity Designer and Affinity photo. I don't know when this started but it's rather recent. NVRAM and SMC have already been cleared. As I start to work on either of the two applications, as I move the mouse in and out of the canvas, the screen blacks out and takes a few moments to come back. When I move the mouse again it blacks out again. Having suggested Affinity to several friends and wasting my time trying to introduce these tool in my workflow... this is frustrating. Is there a solution for this? If not, will I be entitled to a refund? Just encountered this myself after updating to the latest Affinity Photo version. Even after switching the rendering mode to "Software" on Affinity Designer the problem persists. We are already aware of a couple issues from similar reports when using two monitors. Can you provide us a few mode details? which type of connection (second monitor) are you using? What display setting do you have selected (Affinity Preferences, Performance) for Display: Metal or OpenGL? Any proposed workarounds (color space, resolution, etc., would be welcome). My issue with flickering seems to be resolved tonight. 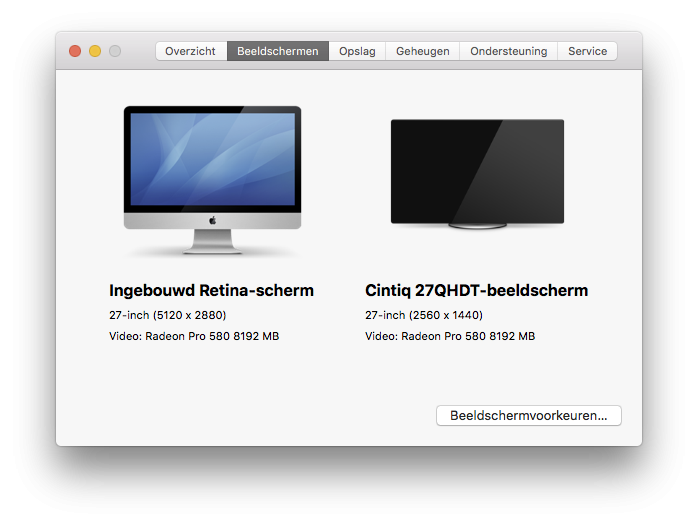 My MacBook Pro (2017) was connected to my external monitor (Acer 2560x1440 res) via an HDMI adapter. I read somewhere that this type problem could be caused by the adapter/cable converting the signal from 60 to 30 Hz (no idea if this is true) with a recommendation of getting a cable to run directly from the Mac usb-c port to the monitors’s DisplayPort. A $15 cable from Amazon seems to have fixed this issue for me. My monitor was solid for 2.5 hours with AP 1.6.6 tonight. A new Macbook Pro from 2018 (13-inch, 2018, Four Thunderbolt 3 Ports). OS is 10.13.6. Second monitor is EIZO FS2434. How are you connecting the MacBook to the external monitor? Are you using the DVI-D or HDMI ports?